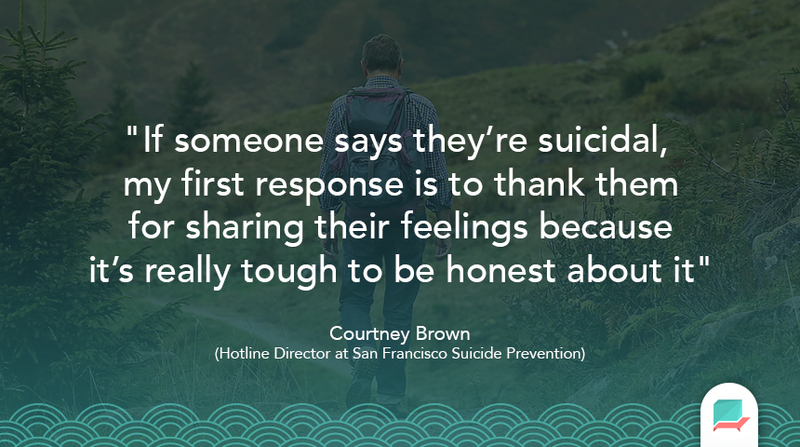 “If someone says they’re suicidal, my first response is to thank them for sharing their feelings because it’s really tough to be honest about it. The next step is to talk about what they’ve been going through and connect with them. The wrong step is to try to immediately tell them how good their life is or how great they are. That actually does the reverse of what’s intended. Instead of making them feel better, it makes them feel like there’s something wrong with them because they can’t be happy given their circumstances. It actually increases suicidality.” – Courtney Brown, Hotline Director at San Francisco Suicide Prevention. “Instead, agree with them by saying something like, “You’re right, everything’s really hard right now, you’re going through a lot, and I want to support you through this.” You should also try to keep them safe. For example, ask them about any harmful medications or objects that they’ve thought of using to hurt themselves and try to restrict access to them.” While most people do not go through with their suicidal thoughts and just need someone to talk to, if you think someone is in immediate danger, do not leave them alone—stay there and call 911. Myth #1: Only people with suicidal thoughts should call the suicide prevention hotline. Myth #2: If you call the hotline they will send the police to your door. “When you journal without any sort of prompt, you’re feeding into whatever your stream of thought is. Especially if someone’s having a panic attack or an anxious episode–they might end up using the journaling to facilitate an anxiety spiral. Something a little more directive might be more helpful. To have a tool that reminds people to journal and redirects them would be hugely helpful,” says Courtney. Visit San Francisco Suicide Prevention for more information and check out Therachat to learn more about journaling tools available to therapists and clients.